NowLow - Presenting products from many online shops with Free Shipping Worldwide. 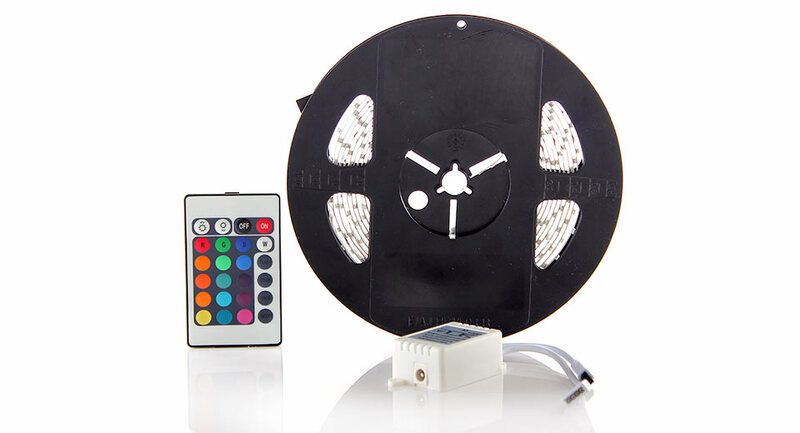 Welcome to NowLow Car Led Light Strip RGB. 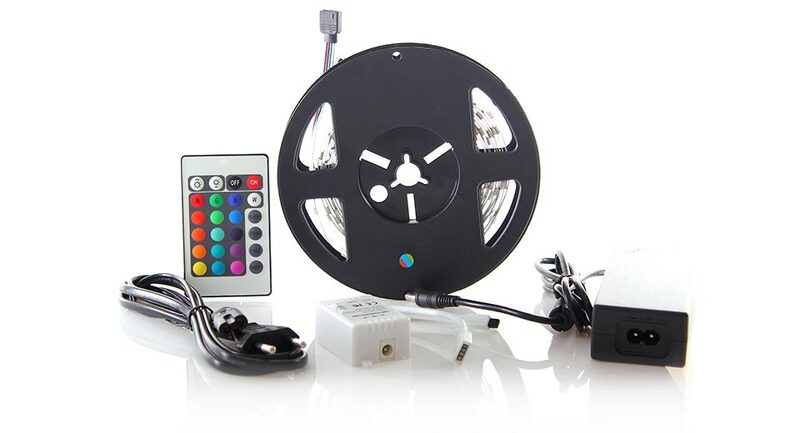 Features: 1、Enegry saving low heat and long service life2、Suitable for decoWarranty: Two yearsAdhesive back tape 16 color changingWith 24 key IR remoteLighting modes: Flash Strobe Fade and Smooth Color: multicolorWorking current: 0.6AWorking temperature: -20° to 50°Note: Please do not cover the receiver when using.If the remote controller's color does not match with the light's color please operate according to the following instructions: 1. Turn the light off by ON/OFF key of the remote controller . 2. Place the remote controller towards the signal receiving port of the controller and press the key on the lower right corner( 24 keys remote controller: Please press SMOOTH key. 44 keys remote controller: Please press FADE7 key ). If the strip light flashes it indicates successful adjustment. 3. Turn the light on by ON/OFF key of the remote controller and observe whether the lighting color is matched with the remote controller's color. If the lighting color is still not matched with the remote controller's color then repeat the steps above until the color is matched(6 times for a cycle). Note: There are positive and negative pole on the 4PIN joint of the strip light. Wrong wiring will lead to strip light not being bright or the lighting color being unable to adjust. Pay attention to the installation direction and there is a direction indicator on the plastic terminal. Brand new and high quality Low power consumption and Low heating Long service life over 100 000 hours Anti-dust and shockproof Suitable for decorating home boat club hotel bar show room aquarium etc. 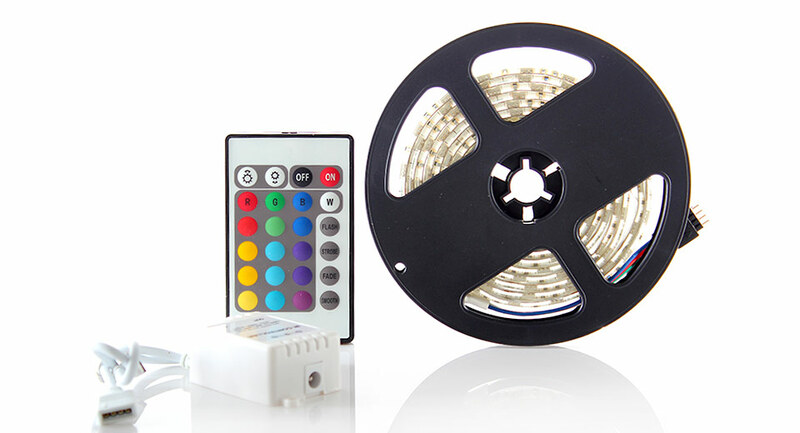 LED type: 5050 SMD LED quantity: 60 ( 30 LEDs per meter ) With 3M adhesive back tape Color: multicolor (16 colors) With 24 key IR remote Lighting modes: Flash Strobe Fade and Smooth Lighting angle: 120° Input voltage: DC 12V Size: 200 x 1 x 0.2 cm (LxWxH) Working temperature: -20°C to 60°C 3 LEDs per group Can be cut With controller and user manual Plug not include 1 X LED strip 1 X remote 1 X controller 1 X user manual ( in English ) In original package Note: This product does not contain power supply. Brand new and high quality Low power consumption and Low heating Long service life over 100 000 hours Anti-dust and shockproof Suitable for decorating home boat club hotel bar show room aquarium etc. 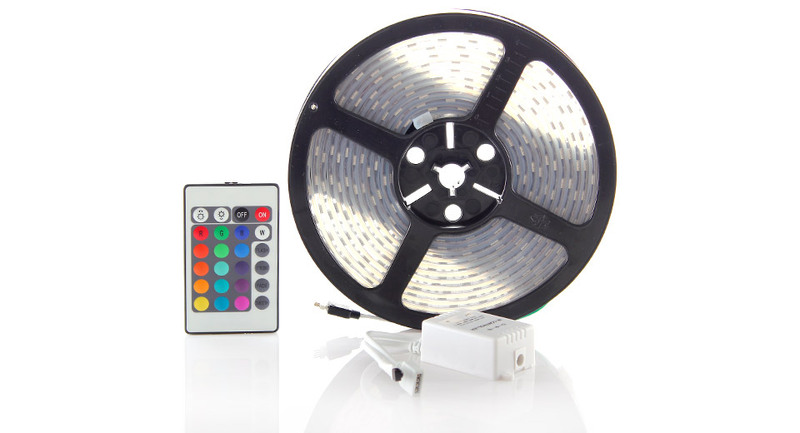 LED type: 5050 SMD LED quantity: 90 ( 30 LEDs per meter ) With 3M adhesive back tape Color: multicolor (16 color) With 24 key IR remote Lighting modes: Flash Strobe Fade and Smooth Lighting angle: 120° Input voltage: DC 12V Size: 300 x 1 x 0.2 cm ( LxWxH ) Working temperature: -20°C to 60°C 3 LEDs per group Can be cut With controller and user manual Plug not include 1 X LED strip 1 X remote 1 X controller 1 X user manual ( in English ) In original package Note: This product does not contain power supply. 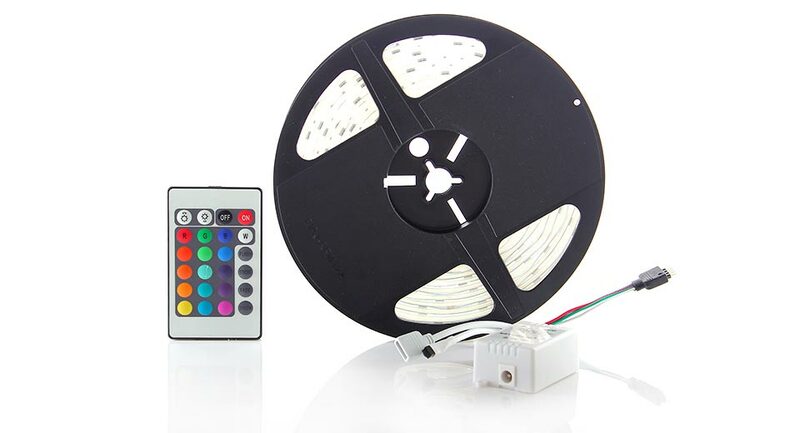 Features: 1.Enegry saving low heat and long service life2.Suitable for decorating home boat club hotel bar show room and so onSpecifications: Input: DC 12V/6A Length: about 5 metersLED type: 5050 PLCC-6 SMT SMD LED Color: RGB 16 colors LED qty. 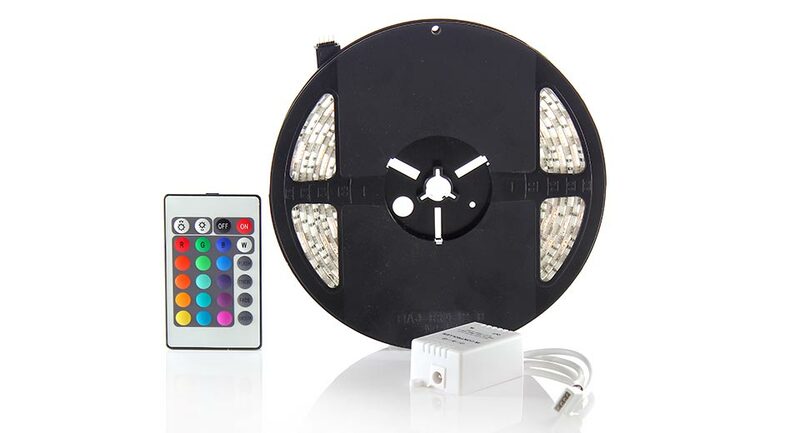 : 300 (60 LEDs per meter)Connection mode: common anode Working temperature: -20°C to 50°CLifespan: 100 000 hours Waterproof Rate: IP65 Remote: 44 keys Lighting modes: Quick/Slow/Auto/Flash/7 Colors Fade Change/3 Colors Fade Change/7 Colors Jumpy Change/3 Colors Jumpy Change Note: Please do not cover the receiver when using.Package Content：1 X LED strip1 X 44 key remote 1 X Controller 1 X User manual Packaged in static bag Note: This product does not contain power supply.